This rug is for a donkey with a No 1 measurement between 53 and 56. If you are unsure if this is the correct size please see how to measure your donkey on the right of this page. A lightweight high performance insulating coat that reflects back 95% of escaping heat keeping the warm in and the cold out. These rugs can be put on a cold or wet animal and through reflection will warm and dry them within a short period. Light and easy to handle. Very valuable for elderly or sick goats. 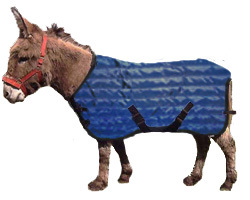 Please measure carefully as we do not send mock coats for donkey rugs.